On 27th July 1967, The Sexual Offences Act made it possible for gay and bisexual men in England and Wales to have sexual relationships for the first time without being automatically criminalised. In response to this milestone in LGBT+ history, public artist Martin Firrell will present a commemorative public art project with the support of Peter Tatchell, world-renowned human rights and social justice campaigner. 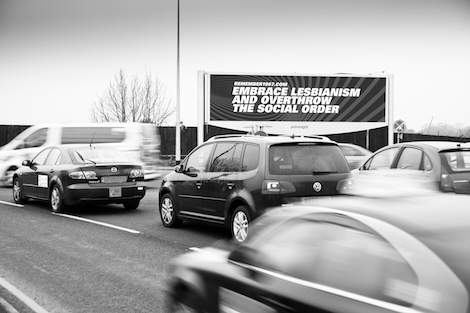 On 27th July 2017 Martin Firrell will take over national digital billboards in England and Wales, re-presenting key ideas from the history of the gay liberation movement. Supported by Clear Channel and Primesight, leaders in digital out-of-home media, for an entire month the ‘Remember 1967’ anniversary billboards will bring powerful messages about freedom and equality to audiences across the country. Martin Firrell will also use the anniversary as a platform to raise new debate and call into question the value of gender labels, asking: what would happen if we moved towards a more ‘gender tender’ approach; where would the harm or the benefit lie? ‘Remember 1967’ has also looked towards the future of equality policies in an artist-led Gender Think-In, inspired by the think-ins held by the Gay Liberation Front, where progressive policy and innovative protest actions were devised through collective creative effort. In June 2017, 200 influential leaders in business, culture and policy were invited to a launch event hosted at the iconic Lloyd’s building to explore the value of gender labels and the implications in their own spheres of influence. The results of this think-in are currently being gathered and will be published by Martin Firrell as a policy paper, mapping out an alternative future for gender. Martin Firrell has been dubbed a ‘cultural activist’, known for provoking public conversations of social value and credited by the Guardian as ‘one of London’s most influential public artists’. Recent projects include ‘Fires Ancient’ and ‘Fires Modern’, two simultaneous projections – on the National Theatre Southbank façade and the dome of St Paul’s Cathedral – commissioned by Artichoke for London’s commemoration of the 350th anniversary of the Great Fire. ‘Remember 1967’ builds on the success of Firrell’s 2016 work ‘All Identity Is Constructed’ which called for greater identity equality using digital billboards and social media with a reach of three million people across the UK – that project of course won the Best Digital Out of Home Campaign at The DailyDOOH Gala Awards in 2016. Martin Firrell was quoted as saying “No other human rights movement has seen so much progress in the space of 50 years. That is to be celebrated. And the activism that made that possible should be acknowledged. But there is always more to be done. How we think about gender now will liberate – or blight – people’s lives for the next 50 years”. ‘Remember 1967’ invites journalists, broadcasters and commentators to add to the debate about the value of gender labelling and the case for a gender tender world. This entry was posted on Thursday, July 27th, 2017 at 08:00 @375 and is filed under DailyDOOH Update. You can follow any responses to this entry through the RSS 2.0 feed. You can leave a response, or trackback from your own site.